Bring stock to a boil and add carrot and ginger. When it comes to a boil again, lower the heat and simmer 2 minutes, add the salt and pepper. 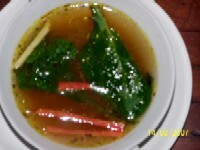 Place spinach leaves in the soup bowls, pour hot soup over and serve.